by Eugen Rosenstock-Huessy, Eugen May, and Martin Grünberg. Brendow Verlag, Moers, Germany, 1997. Hardbound, 286 pages. Rosenstock-Huessy confronted the fact that in destroying master craftsmen’s independent workshops, the Industrial Revolution had deprived them of both work autonomy and a valuable asset to bequeath. He declared the necessity of a kind of “industrial feudalism” to redress this loss. 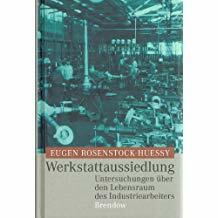 In Werkstattaussiedlung, originally published in 1922, he proposes setting up experienced workers in their own shops, obligated to meet production quotas for the parent company, but otherwise free to take on outside work and to organize production as they see fit. Over time, ownership of the satellite shops would pass to the former employees, who would then be free to bequeath the shop as they saw fit, the contractual obligation to the parent company remaining in force. The book starts with the life story of the lathe operator Eugen May and closes with a proposal for enabling legislation under the Weimar constitution.